The world is truly interconnected, and chance events play out in remarkable ways. That’s my conclusion upon hearing how the “Getsemani” project came to be. 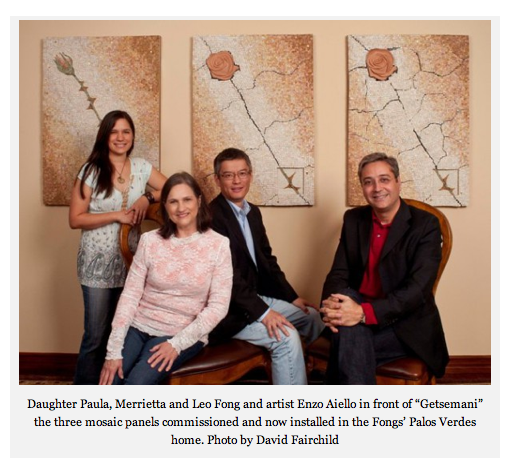 Comprised of three mosaic panels by Italian artist Enzo Aiello, the completed work now hangs in the Palos Verdes home of Leo and Merrietta Fong. The Fongs didn’t just find the panels at Target or Macy’s, they commissioned the work. How that materialized tells us a great deal about how art is conceived, discussed, created, and where it ends up in the 21st century. Leo Fong runs QuinStar Technology, Inc., an engineering design and manufacturing company in the microwave and millimeter wave industry, and in Rome he has a friend and business partner named Giuseppe. At the beginning of this year the two men were having dinner in the Eternal City when Giuseppe received a phone call from his friend Enzo. Giuseppe said, why don’t you come and join us? That evening, before parting, Enzo Aiello handed Leo Fong a business card. “Leo brought the card home,” says Merrietta, “and was telling me [about the artist], and we looked at his website. Beautiful art, just fascinating.” She sent Enzo an e-mail, complimenting him on his work. He sent her a friendly note in return. “Well, if you’re ever inLos Angeleslook us up,” Merrietta replied. As it turned out, Enzo accompanied Giuseppe toCaliforniaat the end of March. “We ended up going out to dinner, and then spending a day together at the new Getty,” Merrietta says. Afterwards, they gathered at the Fong residence and Enzo suggested that he show them his current projects. Enzo Aiello didn’t come up with his concept for the Getsemani (orGethsemane) project overnight. He says he’d been thinking about creating it for the last twenty years. Not many of us can say that, right? Not only does Enzo paint, sculpt, and work in mosaic, he also restores and repairs damaged artwork. Is it a full-time occupation? Meanwhile, far fromRome, Merrietta Fong is a CPA and heads up a public accounting firm inTorrance. She and husband Leo – who was born in Taiwan and raised in Hong Kong – met in college in Indiana, where Merrietta is from originally. They lived inSt. Louisfor eight years, moved briefly toSan Jose, and have now been in our neck of the woods since 1987. Their daughter, Paula, is majoring in Chinese and linguistics at UCLA. The home they live in is fairly new, just three years old, and that’s because they decided to rebuild on the site of their previous house, having become so attached to the neighborhood. I don’t blame them. It’s in one of those treasured enclaves whereCrenshaw Boulevarddisappears into the clouds. Enzo had already completed a prototype of the first panel, on a smaller scale, and after it had been agreed upon that the three panels would each be 70 by 100 centimeters in size (two-plus by three-plus feet), Enzo commenced work on the Getsemani project in May. He points out that it took nearly six months to complete. Why that long? Because each piece, each tesserae, needed to be hand-cut. It’s sort of like creating your own jigsaw puzzle from scratch. The result looks like something pulled from the depths ofPompeii, while simultaneously having a modern allure. In other words, the Getsemani project looks like it has its feet in more than one era. Now, why is it called the Getsemani project? It’s about time you asked. And this is what one sees in the finished work, a progression in which a rose – symbolizing love, or, with its sharp thorns, martyrdom – pushes through a restraining barrier. The artist himself says that the work is open to each person’s interpretation. It may be an illustration of mind over matter for one person, the power of faith for another, or even something as simple and pure as love conquers all. But what also draws our attention to the three panels is the way in which Enzo has emphasized the fractures or fissures as the mosaic, or the wall itself, seems ready to burst asunder as the rose emerges. This is an unusual dynamic that conveys a very real tension. Enzo is teasingly asked what a fourth or fifth panel might look like. Perhaps they would become sculptures, he replies – and, indeed, in the second and third panels, a sculptural quality (especially in the roses themselves) is already present. The works have other individual touches, such as the insets, a tiny square niche in the lower right hand corner of the second and third panels. The idea for this came from a Polish sculptor whose work Enzo saw inRome. Similarly, the gold flecks scattered loosely about the mosaic tiles were inspired by the works of a Futurist painter – Futurism, as propagated by Marinetti, Boccioni, Carà, Russolo, et al, was Italy’s best known contribution to early 20th century art, excepting, of course, Giorgio de Chirico. The purpose of the gold flecks is to catch and reflect the light, and at the same time, I think, to give it a bit of sparkle and life. For example, a night sky is made more compelling by a sprinkling of stars, the way a dash of salt can bring out intrinsic flavors in home cooking. Marietta Fong was content to wait for the work to be finished and delivered, but that was before she talked about the work-in-progress with one of her former business partners, Ray Frew. “I described it to Ray, and Ray said, you know, when I collect art or have something [special] that’s not just for decorative or investment purposes, there’s always some kind of meaning attached – either a place that I’d been to or an artist that I really know, or something about the work that has particular significance for me. He said, I think you should go toRomeand watch this being created. “I said, I like the way you think, Ray!” She laughs. “So I asked Enzo [if it] would be okay if I came toRometo see the project. He was very kind, very gracious. He said, not only can you come but you can come to the studio and you’re welcome. So I did. I went toRomeand spent a week there. She’d known what to expect, of course, having seen photographs on Enzo’s website. Were the Fongs harboring a preference for Italian art? “Well, two things,” Merrietta replies. “Our home is sort of Italian in style, and that’s helpful. But until we met Enzo and saw his work I didn’t really envision specifically something like this.” In short, she says, when they saw the work it spoke to them and they fell in love with it. I point out that the panels fit perfectly into the color scheme of their surroundings. Enzo sits up. “This is pretty strange because, as I tell you, I had already made a prototype, a small one with the same color.” It was one of those chance occurrences I spoke of in my very first sentence. Enzo then remarks that the marble in the panels looks very good on the walls and goes nicely with the overall décor. Enzo Aiello returned to theUnited Statesearly last month. And did the work arrive at the same time? “They just like to take their time, I think,” Merrietta says with a laugh. “It’s a question of bureaucracy sometimes,” Enzo explains. “In Italy, when you send art outside the country you have to fill in papers which show pictures of the art you are exporting, claiming what it is, how much it weighs, what it describes, when it was made” – as well as where it’s from and who made it. Apparently, this is as time-consuming a process on one end as it is on the other. It was also nice that he was here when you had your soiree. Lee Fong enters the room and is asked his opinion of Enzo’s latest masterpiece. “It’s not the best [answer] for an artist,” Enzo says, and everyone laughs. And yet it’s not a bad response.